In this day and age, your Web-Based Co-op MDF Program needs to think smarter and act faster if it’s going to generate any actual ROI. With time and a cohesive strategy, your Co-op or MDF program can be your most powerful channel program yet. We created this white paper to help vendors implement some best practices in their Co-op/MDF process in addition to identifying the key benefits of automation. 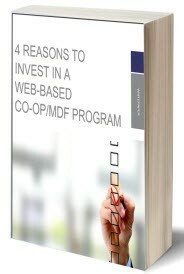 Grab your copy of “4 Reasons to Invest in a Web-Based Co-op MDF Program” today by filling out the form to the right.